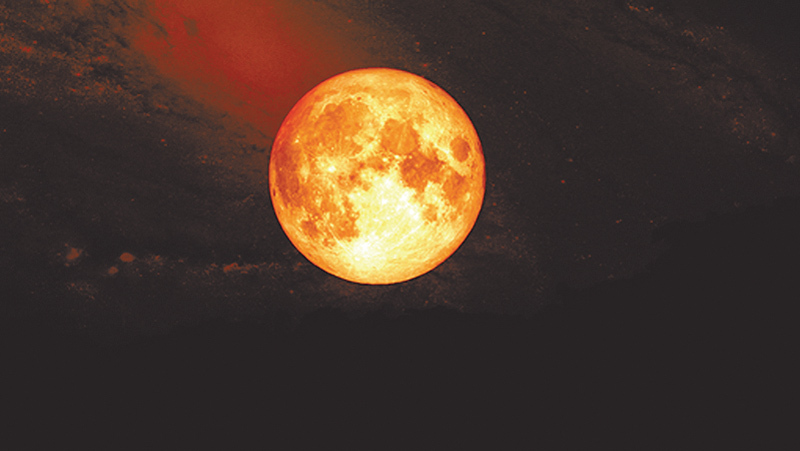 For the first time since 1866, three lunar events - a blood moon total lunar eclipse, a super moon and a blue moon will be visible to us on January 31, 2018 at moon rise in the eastern horizon after 6.15 p.m, Colombo University Astronomy and Space Science Unit Director Prof. Chandana Jayaratne said. Professor Jayaratne also said that there would be somewhat of a high tide on that day due to the closeness of the moon. He added that no earthquakes or other natural disasters have been reported in the past during similar occurrences, though there were rumours spreading about the onset of natural disasters such as earthquakes, Tsunamis, cyclones etc. Prof. Jayaratne explained a total lunar eclipse is called a Blood Moon, because of the reddish colour of the Full Moon takes on when fully eclipsed. He further said that when a Full Moon takes place while the Moon is near its closest approach to Earth, in its elliptical shape orbit around the Earth, the moon is called a Super Full Moon or a Super Moon. He added that however when two full moons fall in the same month, the second full moon is called the blue moon though it does not appear in blue in colour. He also added that these three lunar events take place on January 31 this year. He said that the total lunar eclipse would be visible to Sri Lanka with the moon rising around 6.15 p.m. Prof.Jayaratne added that the eclipse begins at 4.21 p.m. Sri Lanka Standard Time and would last till 9.38 p.m. From the time the eclipse occurs during day time for Sri Lanka, only the latter part of this eclipse would be visible to us after sunset. The total eclipse could be observed after 6.22 p.m with the moon completely entering into the umbra - the dark shadow of the Earth.